Friday is the the vernal equinox (otherwise known as the official first day of spring) and it continues to look snowy. There have already been reports of snow mixing in with rain at times across parts of southwestern Virginia this morning. The National Weather Service in Sterling has issued Winter Weather Advisories for the areas shaded below (including the northern Shenandoah Valley and locations right along the Blue Ridge) for as much as 2-4" of snow. I will be making any necessary changes to my forecast (scroll down to post from yesterday) later this evening. Bottom line: Light rain this evening will mix with and change to snow overnight...continuing into the morning hours Friday before changing back to rain. Chances for accumulation will increase the further north and higher in elevation you go. For the immediate Harrisonburg area, currently expecting anywhere from a coating to an inch. After a decent stretch of very nice, warm spring weather...another round of wintry precipitation is on the way. This isn't all that uncommon; flakes can fly in the Shenandoah Valley as late as April (even early May on rare occasions). On Thursday...an area of high pressure will drift east across the northeast keeping things cool and dry across the area. 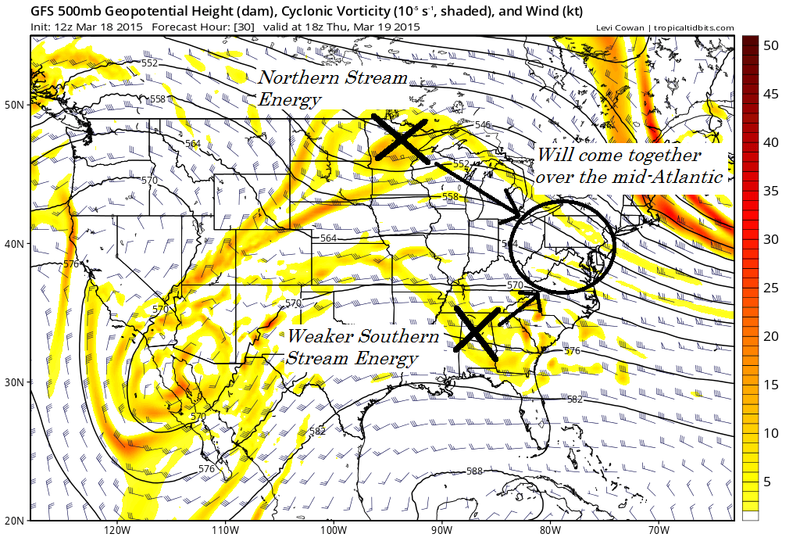 Two pieces of energy (one southern stream and one northern stream) will combine over the area Thursday night allowing precipitation to break out. With the colder, dry air in place...this will begin as snow for many late Thursday night. The entire Shenandoah Valley has the potential to see some flakes with a quick coating not entirely out of the question. A warm ground and marginal temperatures will certainly be limiting factors. Looking ahead...it looks like we'll continue to see an active pattern with shots of colder weather through the rest of March and into early April. It becomes a matter of timing a few things up to see more flakes fly. We're nearing the end, but not done just yet.